BACKGROUND AND PURPOSE: The safety of placing multiple overlapped endoluminal flow diverters remains unclear because small eloquent branch arteries theoretically could become occluded by these devices. We placed single and multiple flow diverters over small branch arteries in rabbit aortas to determine the incidence of branch artery occlusion. MATERIALS AND METHODS: Flow diverters (PED) were placed into 22 female New Zealand white rabbits abdominal aortas to cover ≥1 lumbar artery. Animals were divided into 3 groups (single PED, n = 9; double PED with 2 telescoped/overlapped devices, n = 7; and triple PED, with 3 telescoped/overlapped devices, n = 6) and were followed for 6 or 12 months. DSA was performed at follow-up. Subsequently, the tissue was processed, sectioned, and stained with H&E for histologic evaluation, histomorphometry, and analysis. RESULTS: All the lumbar arteries covered by devices were clearly patent on angiography. Partial neointima covered the ostia of the branch vessels, but demonstrable patent lumens at the ostia in all cases were present. Neointima hyperplasia was minimal in the single-PED-group animals. The measured neointima was thicker for the double- and triple-PED groups compared with the single-PED group (P < .05). However, in all groups, the mean thickness of the neointima was ≤0.2 mm, and the percentage stenosis of the parent artery was <15% and 18% for 6 and 12 months, respectively. There was no significant inflammatory response in any group. CONCLUSIONS: Small branch arteries remain patent even when covered by multiple overlapped PED flow-diverter devices. Flow-diverter therapy is gaining widespread acceptance for the treatment of intracranial aneurysms. Both preclinical and clinical studies of flow diverters have shown acceptable safety and efficacy.1–7 Notwithstanding the early promise of these results, important gaps in knowledge remain. For example, in many cases, practitioners may choose to place multiple telescoping/overlapping devices, one inside the other, to increase the degree of flow diversion compared with the use of a single device.8 The risk of a small branch artery occlusion adjacent to the target aneurysm and covered with the flow-diverter device or devices appears low. However, the impact of multiple, compared with single, devices on branch artery patency has not been previously systematically studied. Previous publications2,9 have applied a rabbit aortic implantation model to simulate the scenario of small perforating arteries in the human intracranial vasculature. This rabbit aortic model is well-suited to simulate the dimensions of both the parent artery and perforating arteries, with diameters of approximately 4 and 0.6 mm, respectively. In the current study, we evaluated the safety of the use of single and multiple flow-diversion devices in the rabbit aorta, in terms not only of chronic patency of adjacent small branch arteries covered by the devices but also of the degree of neointimal hyperplasia within the parent artery. Twenty-two female New Zealand white rabbits were used in the study. The Institutional Animal Care and Use Committee at our institution approved all procedures before the start of the study. Two days before embolization, animals were premedicated with aspirin (10 mg/kg PO) and clopidogrel (10 mg/kg PO); both medications were continued once a day for 30 days postembolization. Anesthesia was induced by using 74-mg/kg ketamine, 5-mg/kg xylazine, and 1-mg/kg acepromazine and was maintained by using ketamine (10 mg/kg) and xylazine (3 mg/kg). A surgical cut-down of the right femoral artery was performed. The artery was ligated distally; a 0.018-inch guidewire was passed through the angiocatheter followed by placement of a 5F vascular sheath. Heparin (100 U/kg) was administered intravenously. A 5F Envoy catheter (Cordis, Miami Lakes, Florida) was advanced into the abdominal aorta. The size of the abdominal aorta was assessed by using direct comparison with radiopaque sizing devices during DSA. The exact locations of lumbar arteries visualized by DSA were carefully noted. Using a coaxial technique, with continuous heparinized saline flush, a Marksman microcatheter (ev3, Irvine, California) was advanced into the abdominal aorta. A single PED (Chestnut Medical Technologies, Menlo Park, California) (single-PED group) was placed in the aorta across the origin of at least 1 pair of lumbar arteries in 9 animals and followed for 6 months (n = 2) or 12 months (n = 7). The next group (double-PED group), total sample size = 7, had 2 telescoped (overlapping) PEDs, one inside the other. These were placed and followed for 6 months (n = 3) or 12 months (n = 4). The final group (triple-PED group), sample size = 6, had 3 telescoping (overlapped) PEDs. These were placed and followed for 6 months (n = 3) or 12 months (n = 3). At the time of implantation, a DSA was performed immediately post-device deployment. Then the guide catheter and sheath were removed. The femoral artery was ligated. Animals were allowed to recover. At sacrifice, animals were anesthetized as mentioned above. A DSA of the abdominal aorta was performed. Animals were then euthanized with a lethal injection of pentobarbital. The aortic arteries were perfusion flushed with 0.9% saline and were harvested and fixed in 10% neutral buffered formalin for further histologic evaluation. One experienced observer with >20 years' experience evaluated all the angiographic images in the current study. The angiographic images at the time of PED placement and at the time of follow-up were evaluated and compared. The patency of the branch lumbar arteries covered by the devices was assessed. A 4-point qualitative scale (none, mild, moderate, or severe) was used to grade the stenosis of the aorta bearing the implants. Gross inspection of the aorta was performed to determine whether the treated segment was patent and to confirm, by direct inspection, that the implanted devices did, indeed, cross the lumbar artery origins. The diameters of the lumbar arteries covered by the devices were measured under a dissection microscope (Leica MZ12; North Central Instruments, Minneapolis, Minnesota) at their ostias. After routine tissue processing, the fixed samples were embedded in paraffin. Samples were then cut axially at 1000 μm with an IsoMet Low Speed Saw (Buehler, Lake Bluff, Illinois). The metal struts were carefully removed under a dissecting microscope. The samples were then re-embedded in paraffin, sectioned at 5 μm, and stained with H&E. One experienced observer with >10 years of experience evaluated the histologic sections, as described previously.9 Axial sections were taken from the proximal, middle, and distal portions of the aortic segment bearing the devices. We performed morphometric measurements by using digital planimetry with a calibrated microscope system.10 The external elastic lamina area, IEL area, and luminal area were measured. Neointimal thickness was measured as the distance from the inner surface of each PED strut to the luminal border. Calculations made from the morphometric measurements were as follows: Neointimal Area = IEL Area − Injured Luminal Area; Percentage Stenosis = (Injured Luminal Area ÷ IEL Area) × 100%; Mean Neointimal Thickness = (Sum of Neointimal Thickness) ÷ Number of Struts. We averaged the proximal, middle, and distal morphometric measurements to get the final result for each subject. A 2-way ANOVA (JMP, Version 8.0; SAS Institute, Cary, North Carolina) was performed to examine differences with and between groups. If the 2-way ANOVA was significant, we then looked at the interaction (Time × Group). If there was a significant interaction, then Tukey-Kramer HSD post hoc test was performed. If the interaction was not significant, then the main effects test for groups was examined. If there was a significant main effect, then a Tukey-Kramer HSD post hoc test was performed. All rabbits underwent angiography at the prespecified survival time. 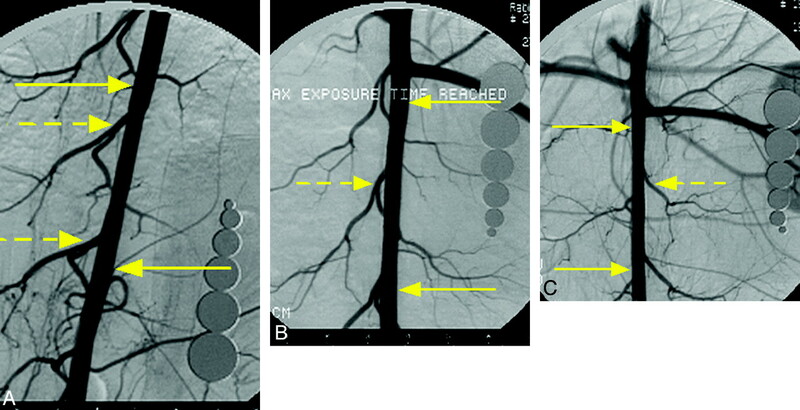 At angiography, all lumbar arteries that were visualized immediately post-PED placement were again visualized, and all lumbar arteries were clearly patent (Fig 1). Nineteen of 22 (86.4%) stented aortas showed no stenosis. The remaining 3 aortas (1 single PED at 12 months, 1 double PED at 12 months, and 1 triple PED at 6 months) all showed (<10%) stenosis. Representative angiograms from each group at 12-month follow-up. A, Subject from the single-PED group. B, Subject from double-PED group. C, Subject from triple-PED group. In each case, the DSA images show that the lumbar arteries covered by the device remain patent. The yellow arrows indicate both ends of the devices, and the dashed yellow arrows indicate the lumbar arteries. Aortic arteries were patent at all time points. There was measurable neointima formation throughout the aortic segments containing the devices in all groups at all time points. The neointima hyperplasia was minimal in all single-PED-group animals. The measured neointima was significantly thicker for the double- and triple-PED groups compared with the single-PED group at both 6 and 12 months However, in all groups, the mean thickness of the neointimal hyperplasia was ≤0.2 mm (Fig 2 and Table). The mean percentage stenosis area for single, double, and triple groups at 6 months was 8%, 13%, and 15% respectively; whereas it was 7%, 10%, and 18%, respectively, at 12 months. Although the percentage stenosis was larger for double- and triple-PED groups compared with the single-PED group (P < .05), this difference likely was simply due to multiple devices stacked within the lumen. We measured the distance from the IEL to the lumen; thus the telescoped/overlapping devices would necessarily increase the distances, yielding the apparent neointimal hyperplasia. The medial layers of the embolized aortic arteries in the double- and triple-PED group were thinner than those of the single-PED group; however, there were no differences between groups (P > .05; Table). As noted in previous publications, cartilage and/or bonelike tissue was observed in the wall in a minority of treated arteries. This metaplastic tissue was present in 2 animals in the single-PED group, 1 subject in the double-PED group at 12 months, and 1 subject each at 6 and 12 months in the triple-PED group. There were no significant inflammatory reactions to the devices in any group, at all time points. Representative photomicrographs from each group at 12 months. A, Subject from the single-PED group with minimal neointima hyperplasia (H&E, original magnification ×25). B and C, Subject from double- and triple-PED groups, respectively, with neointima thicker than that in A. However, the stenosis area was mild, and the aortas are widely patent (H&E, original magnification ×12.5). Gross examination showed that all lumbar arteries covered by PEDs remained patent during all time points for all groups; a saline flush showed prompt flow into the branches from the aorta. The lumbar artery diameters for the single-PED group, double-PED group, and triple-PED group were 0.7 ± 0.4, 0.7 ± 0.4, and 0.6 ± 0.4 mm, respectively (P > .05). In all groups at all time points, there was neointima partially covering the devices over the ostium of the branch lumbar artery; however, patent channels were present in all cases through the struts of the devices (Fig 3). Photomicrographs of same subjects as in Fig 1 showing the lumbar artery origins. A, Subject from the single PED group with device struts across 2 lumbar arteries. The neointima crossing the ostia of lumbar arteries is discontinuous (arrows); thus, the lumbar arteries are patent (H&E, original magnification ×25). B and C, Subject from double- and triple-PED groups, respectively, with neointima partially covering the ostia of lumbar artery branches. However, this neointima is also discontinuous (arrow); thus, the branch vessels are patent (H&E, original magnification ×40). In the current study, we have shown excellent patency of small branch arteries, similar in diameter to perforating arteries in the human intracranial circulation, after coverage with ≤3 flow-diversion devices. In addition, the degree of neointimal hyperplasia within the parent artery remained mild, irrespective of the number of implanted devices or the duration of implantation. These findings suggest that the use of multiple telescoped flow-diversion devices might be well tolerated clinically in cases in which the practitioner believes that multiple devices would improve aneurysm occlusion rates compared with single devices. Previous studies have noted excellent patency of branch vessels as well as minimal degrees of neointimal hyperplasia after treatment with single flow-diversion devices in the same rabbit model used here.2,9 The current study extends those prior findings by demonstrating similar safety features when using multiple devices. Several clinical case reports have been published, noting occlusion of branch arteries in patients treated with flow-diversion devices.11,12 One report noted blindness in a patient after occlusion of the ophthalmic artery by using a single device,11 and a second report noted infarction of the territory supplied by the artery of Huebner.12 Overall, however, the risk of such occlusion in existing case series appears low, and this is consistent with the results of this study. The current study had several limitations. First, the number of animals in each group was relatively small. Second, the use of young healthy rabbits may not perfectly simulate the clinical condition. Implantation of the PED into plaque-laden human intracranial vessels may present different risks of acute occlusions. Third, we used a relatively short duration of dual antiplatelet therapy, though a previous study has demonstrated complete endothelialization of the PED in the rabbit model by 30 days.9 Finally, we cannot ascertain the risk of occlusion of arteries smaller than the lumbar arteries in the rabbit. We also thank Moira Lane for helping with preparation of the histology for the study. Disclosures: David Kallmes—RELATED: Grant: Chestnust Medical, Comments: Research support; UNRELATED: Grants/Grants Pending: Sequent, MicroVention, NFocus, Micrus, ev3, Royalties: University of Virginia Patent Foundation, Comments: invention royalties for spine disease, Payment for Development of Educational Presentations: CareFusion, ev3. This study was funded by ev3, Menlo Park, California. Paper previously presented at: Annual Meeting of the American Society of Neuroradiology and Neuroradiology Education and Research Foundation Symposium, June 4–9, 2011; Seattle, Washington.